Medvedev on Khodorkovsky, Magnitsky and Strasbourg court | Russian Legal Information Agency (RAPSI). Former Yukos CEO Mikhail Khodorkovsky will not pose a danger to the public if he is released from custody, President Dmitry Medvedev said at a news conference at the Skolkovo School of Management yesterday. He added that more details into Sergey Magnitsky’s death will soon be unveiled, and also assured the public that Russia will continue cooperating with the European Court of Human Rights in Strasbourg despite the apparent bias of some court decisions. However, legal issues did not dominate the president’s agenda. Aside from these three issues, Medvedev also touched upon the farm bankruptcy problem. Without going into specifics, he suggested introducing a special procedure governing such bankruptcies. Addressing a question about Russia’s relationship with the European Court of Human Rights, Medvedev said Moscow will continue cooperating with the court. Russia largely complies with these decisions, including compensation payments to plaintiffs based on court orders, Medvedev said. “We do not openly question such decisions, but such views do exist,” Medvedev said. Commenting on the president’s remarks, lawyer Anna Stavitskaya told the Russian Legal Information Agency (RAPSI) that she is not aware of any politically motivated decisions by the court. “I do believe, though, that Russian courts’ decisions are often politically driven and, therefore, most of the appeals to the European court are from Russian nationals,” Stavitskaya said. According to the court’s final report for 2010, there were 40,295 appeals to the court from Russia last year, more than from any other European nation. Russia was followed by Turkey with 15,206 appeals and Romania with 11,950 appeals. Most of the rulings were related to violations of the European Convention on Human Rights (102 decisions), followed by violations of the right to a fair trial (89 decisions). The third most frequent type of rulings was related to violations of the article on the right to a fair investigation. A court spokesperson told RIA Novosti that 2010 saw an increase in cases related to violations of so-called absolute rights, including the right to life, the right to freedom, the prohibition of torture, and the right to personal immunity. Early on in the news conference, the president joked that he expected to be bombarded by questions about his possible second presidential term and the Khodorkovsly case. Yet, there was just one question about Khodorkovsky toward the end of the event. Medvedev was asked if Khodorkovsky will pose any public danger if he is released from jail. 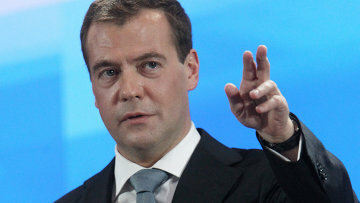 “Let me give you a short answer to a short question – he poses absolutely no danger,” Medvedev said. Khodorkovsky’s lawyer Vadim Klyugvant agrees with the president. When asked to comment on Medvedev’s statement, Klyugvant asked how it is possible to keep a person in custody who does not pose any danger to society. “Only people posing a danger to the public should be kept in jail,” the lawyer added. In December, Moscow’s Khamovnichesky court sentenced Khodorkovsky and his co-defendant, former Menatep CEO Platon Lebedev to 14 years in prison for stealing oil and money laundering. Their first trial in 2004 resulted in an eight-year prison sentence for fraud and tax evasion. Taking into account the time served, Khodorkovsky and Lebedev are due to be released in 2017. The verdict has not entered into force since they have filed an appeal that will be considered by the Moscow City Court on May 24. The court was originally expected to hear the appeal on May 17, but postponed the hearing for a week to allow the judges to review additional evidence. There have been reports in the media that the verdict was postponed due to Medvedev’s news conference. Had the verdict been known before the conference, there would have likely been more questions about Khodorkovsky. Speaking of the high-profile case of Sergey Magnitsky, Hermitage Capital investment fund attorney, who died in police custody, Medvedev said there will be new developments. He said he had meetings with the heads of the Investigative Committee, Prosecutor-General’s Office, and Federal Security Service. The tax fraud allegations in the case also need to be carefully examined, the president said. "The case is not as straightforward as they think, this aspect also needs to be looked into and the guilty parties, both Russian and foreign, have to be identified,” Medvedev added. He emphasized that the public needs to be aware of the investigation’s results. 18:50 20/05/2011 Former Yukos CEO Mikhail Khodorkovsky will not pose a danger to the public if he is released from custody, President Dmitry Medvedev said at a news conference at the Skolkovo School of Management yesterday. He added that more details into Sergey Magnitsky’s death will soon be unveiled, and also assured the public that Russia will continue cooperating with the European Court of Human Rights in Strasbourg despite the apparent bias of some court decisions.